There's more than one story behind the northern lights. In a strictly astrophysical sense, the lights are the high-speed union of charged solar particles and atmospheric gases. In Inupiat folklore, they're cosmic spirits, guides and predators. A new film produced in collaboration with University of Alaska scientists and Inupiat elders aims to bring all those stories to the dome screen. "Kiuġuyat: The Northern Lights" features 25 minutes of northern lights timelapse photography and interviews with Alaska Native people from Arctic regions of the state. It opened last month at the University of Alaska Anchorage Planetarium and Visualization Center. "We want to use this planetarium to tell the story of Alaska," said Dr. Travis Rector, a UAA physics and astronomy professor who helped build the planetarium and contributed to "Kiuġuyat's" production. "We want to make shows that share with people what makes Alaska special and unique." 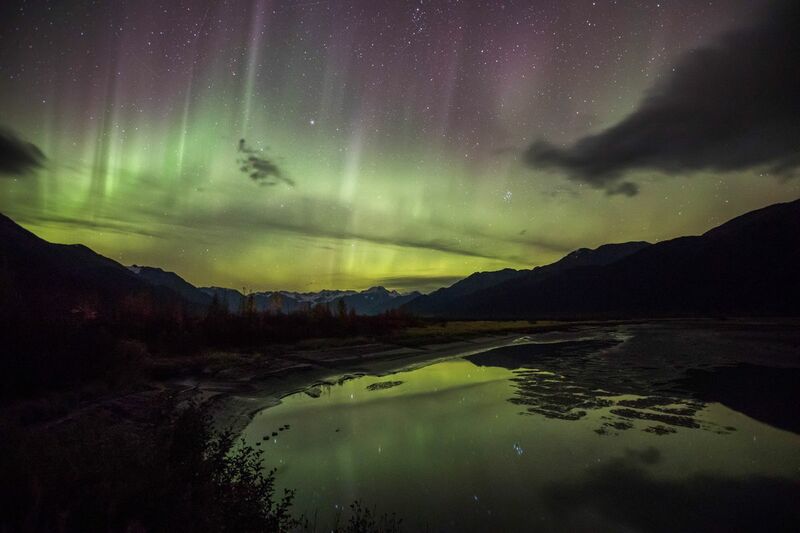 Alaskans share an ancient relationship with the aurora. In "Kiuġuyat," filmmakers interview more than half a dozen Alaska Native people about their cultural connections to the northern lights. MaryJane Litchard of Nome described the lights as a bright presence, casting a comforting glow over northern communities blanketed in winter darkness. Fannie Akpik of Barrow described them as a constant, colorful part of Arctic life. Others described the way the lights illuminated the way for travelers in the backcountry. Many spoke about old legends meant to instill fear in children. According to some tellings, the lights are cosmic spirits playing ball in the sky, just waiting to swoop down and chop off the heads of wayward young people. If you stay out too late, or don't come when your mother calls, or walk alone at night, "The northern lights will get you," said Annie Conger of Nome. The making of "Kiuġuyat" was funded by a $1.4 million U.S. Department of Education grant awarded to the University of Alaska Fairbanks in 2014, Rector said. Lacking the experience to make a full-blown planetarium show, UAF collaborated with UAA, where staff have been making dome videos since the university planetarium opened in 2008. Different from regular planetariums, the UAA theater can display an entire hemisphere's worth of video, allowing audience members to lean back and see the full night sky. "Kiuġuyat" is the third original film to premiere at the Anchorage visualization theater, Rector said. Shot by Arizona-based Open Lens Productions, the video is scheduled to travel to 20 rural Alaska communities, where students can watch the show with the help of a portable, inflatable planetarium operated by the UAF Geophysical Institute. Accompanying curriculum, "Learning Through Cultural Connections," is intended to introduce elementary and middle-school age students to the science and cultural stories surrounding the aurora, according to the university. At the UAA planetarium, "Kiuġuyat" unfolds in two parts. Following the video itself, there's a 30-minute presentation by a UAA professor, so "it's never the same show twice," Rector said. The film explains the basic science behind the cosmic phenomenon, caused by the collision of charged solar particles with gas particles in the Earth's atmosphere. Because the lights are sparked by particles from the sun, solar storms usually lead to the most active auroras. It takes up to four days for those solar particles to reach Earth from the sun, Rector said. The resulting northern lights occur between 60 and 600 miles above the ground. But science is just one part of "Kiuġuyat." Most of the show revolves around the many legends, memories and experiences surrounding Alaska's northern lights. "My favorite part was hearing the stories," Rector said. "Kiuġuyat: The Northern Lights" shows at 6:30 p.m. Feb. 24 at the UAA Planetarium and Visualization Theater. Tickets are $5-10 online at UAATix.com and $6-12 at the door.